East Champaran is known for its traditional anthology of folk songs. These songs enjoy their own importance according to occasions. Jhumari dance is a widely loved dance form of East Champaran and is performed by married women. East Champaran also offers a variety of cuisines. The place is known for its mouth-watering desserts, such as chhena murki, kesaria peda, khaja, malpua, khurma, thekua, tilkut and murabba. Like every rich culture, East Champaran revels in the joy of its festivities. The famous Chhath Puja is the main Hindu festival of East Champaran, dedicated to Sun God. It is celebrated twice the year; once in Chaitra (March) and the other time in Kartik (November). Tourists can plan a visit to East Champaran around the festive times of Makar Sankranti, Holi and Durga Puja, which are celebrated in the district with much faith and enthusiasm. Chhatth Puja is one of the important festivals celebrated in East Champaran. This festival is also a famous in whole Bihar. This is the only festival in which the setting sun is worshipped. East Champarians celebrate this festival with immense faith. Chhatth Puja is celebrated twice a year. First one is in Chaitra (March) and another one in Kartik (November).This is a 4 day festival, for which people mainly women maintain cleanliness and purity from even a month ahead. They sing folk songs in the honour of ‘Chatti Maiyya’ and ‘Surya Dev’ and the sweetness of the songs makes you also devoted. Women fast for the good of their family and the society. The rituals of the festival are rigorous and are observed over a period of four days.They include holy bathing, fasting and abstaining from drinking water (Vratta), standing in water for long periods of time, and offering prasad (prayer offerings) and arghya to the setting and rising sun. The main worshipers, called Parvaitin (from Sanskrit parv, meaning ‘occasion’ or ‘festival’), are usually women. 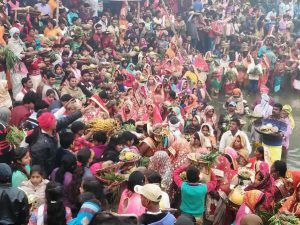 However, a large number of men also observe this festival as Chhath is not a gender-specific festival. Some devotees also perform a prostration march as they head for the river banks.